The Almond+ has a console port in the shape of an RS232 serial port. This can be used to access the console of the Almond+ instead of using SSH or Telnet. It gives you more direct access to the Almond+ and allows you to access the console during boot etc. when SSH or Telnet is unavailable. The pin-out is VCC, TX, GND, RX. Note: The VCC is not used when connecting a standard PC/Mac to the Almond+. To access the console port, you'll have to remove the back of your Almond+. Four screws are hidden behind the rubber feet of the Almond+ and the rubber feet and the screws have to be removed to gain access to the console port. 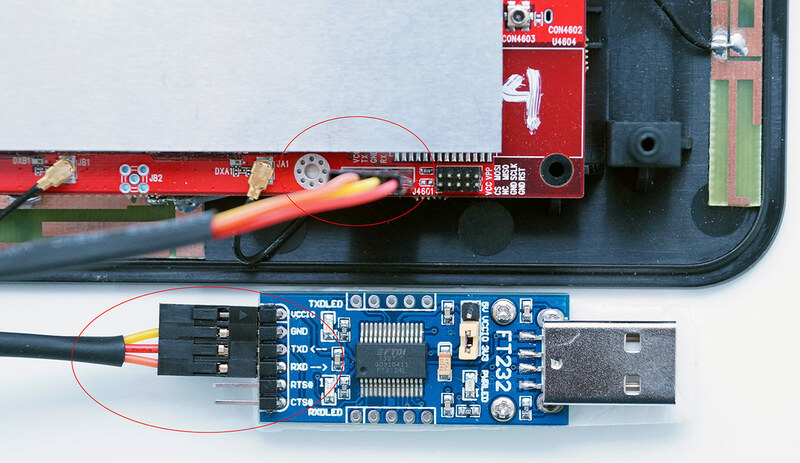 The Kickstarter beta and developer units were supplied with a FT232 USB to serial adapter and a three wire cable to connect it to the console port on the Almond+. For more details about the FT232 USB to serial adapter and drivers, please visit FTDI's website. The cable has to be attached as per the below picture or you you won't be able to access the Almond+ using it. This page was last modified on 18 April 2014, at 02:26.